The Taswell 49 is one model in a line of high quality, high performance yachts designed by Bill Dixon’s Angus S. Primose, Ltd of Southhampton, England and built by the legendary Tainan, Taiwan yard Ta Shing Yacht Building Co. Ta Shing is famous for their Norhavn trawlers as well as Tashiba, Mason, Baba, Panda, and Norseman sailboat brands. 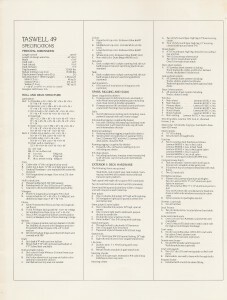 The Taswell series included 43, 49, and 56 foot models originally and later 44, 50, and 58 versions. 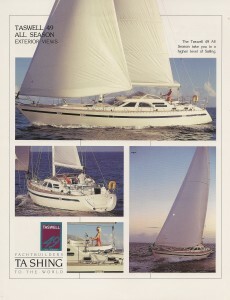 Ta Shing built the line between 1989 and 2003 according to brokerage records. I have a preliminary sketch for a 60-footer in my records which I do not believe was ever built. In addition to the standard deck layouts, Taswell built so-called “All Season” versions of which the 49 All Season is the inspiration and primary focus of this review. These All Season models have full inside helms (throttle and wheel) with completely independent steering systems. In the brochure, Ta Shing writes that their goal was “to create a new standard of excellence for passage making yachts.” Judging by the strong demand 23-years later, they delivered. Please read on for full details of my research into the 49-foot All Season model. There are few yachts that meet the specifications of the 49 All Season version with her full inside helm, airy raised salon, and Dixon performance at a price under half a million. True pilots are rare, and – especially in the high latitudes – they are sought after. This pilot appeal is the foremost attraction of the 49 All Season. That appeal is heightened by the rarity of the model. Ta Shing kept no records of how many hulls they built, and the best guesses by aficionados are in the less than half dozen range. Only two hulls are registered in the brokerage records. 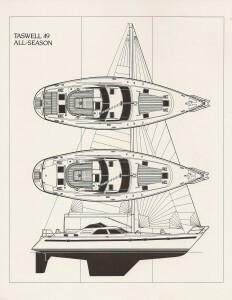 The yacht featured in the original brochure is one of these two and was built in 1991. The other was built in 1990. Construction was robust with up to 18 layers of mat and roving, no core. Please see the manufacturer attachment for a full breakdown of the lamination schedule. The deck and cabin top has a half inch thich end grain balsa core. The deck is joined to the hull with 5200 and 3/8″ diameter stainless steel bolts on 8″ centers. The hull is further stiffened with 3 longitudianal stringers and 9 transverse floors. Ballast material was iron ballast on the standard or optionally lead on the shoal or scheel. The main option was the standard versus All Season deck mold. The low slung, classic standard deck version contrasts sharply with the modern deck salon. That higher cabin trunk leads to the panoramic view that pilot house sailors love. One such client came aboard and told me that the photo missing was a shot from the inside helm forward. That visibility is the key factor in his interest in the model. With the extra vertical space, the All Season has three different interior layouts. Plan A and B are 3-staterooms versions while Plan C has a fourth bunk berth portside, amidships. 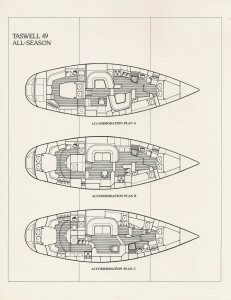 Plan A has a unique aft patio while Plans B and C reverse the aft centerline queen positioning with a more traditional aft deck arrangement. Underneath the 49’s came in standard (6’9″), shoal (5’10”), and scheel (5’3″) drafts. She carries a relatively wide beam, well rounded bilge, deep forefoot, and short overhangs. Displacement is 32,000 pounds while ballast is 40% for 13,000 pounds. If I could make one change to make the design more marketable, I would make her 67′ rig ICW friendly. The 49 All Season strikes me on first impression as a serious cruising machine. Bill Dixon is a gifted designer who is able to mold form around function in such a way to avoid the overwhelming wedding cake deck salons that mare our shores. She also has a robust look, a gelcoat that looks thick and tough to withstand some serious chaff. On my example model, there is a polyetherene rubrail strip like you would find on power yachts that can withstand a dock side beating. High quality hardware is sprinkled around deck. There are high lifelines for safety offshore. Four portholes in the topsides provide light below. The sugar scoop stern has two doors on the double cockpit versions or a ladder mounted to the transom. Teak decking is common and posibly nearing the 20 to 30 year replacement zone. Starting forward, the anchor locker is split horizontally. The top level of the locker is accessable from deck by opening either of the doors. Chain is led through a hawsepipe in the bottom of the locker into the second level which is accessable from below. Next are twin dorades as the cabintop rises, space to store a dinghy and mount a liferaft. These are typically cutter rigged vessels. The cabintop continues until the deck salon which consists of eight windows – the side two of which are curved. Above the deck salon is a hard windshield. The aft deck like earlier touched on has two different arrangements – flush or with a second cockpit that you could mount a fighting chair in. The patio is an excellent place to store fenders and lines. The main cockpit is long enough to lay down in with a rounded aft combing. The aft seating raises to provide an excellent view from the exterior helm just about no matter your height. Dixon did well to prevent the cabin house from blocking your view. Going down the companionway you immediately see why people demand this yacht. The upper area is the selling point with the panoramic view which provides an eye level of whatever sea or shore you are sailing by in. The portside, upper salon area is the primary living area while the starboard inside helm which full throttle, wheel, and navigation controls allow you to cruise comfortably even in harsh climates such as the North Sea, the San Juans, and beyond. You can drive from the inside helm with full lines of sight. In the Plan B and C accommodations the upper salon area is longer. The lower salon and galley / fourth stateroom area depending on which accommodation plan is next. There is a large forward head with a separate stall shower on all layouts along with a v-berth. I am amazed at how much Dixon fit into a 49-footer going forwards. There is as much room as on a Hylas 54. The aft area is similar on the layouts with a master head with tub shower. The Plan A layout has an aft facing centerline queen to accommodate the headroom restrictions. There is a escape companionway leading aft into the patio. All the space below is highlighted by superbly crafted, perfectly radiused Taiwanese teak joinery work. 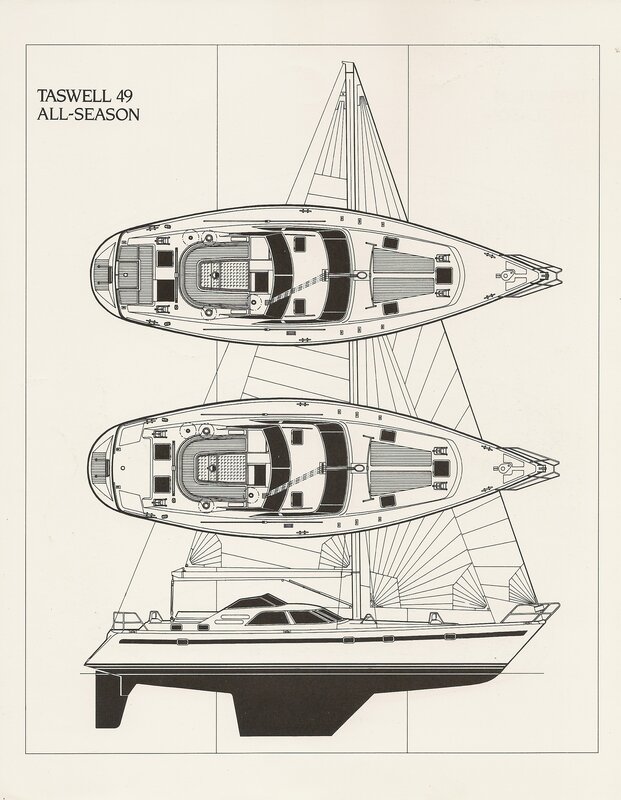 The Taswell series was designed not just for ample accommodations but also a good turn of sail. I helped deliver a 49 All Season from Fort Lauderdale to Savannah in February 2013. 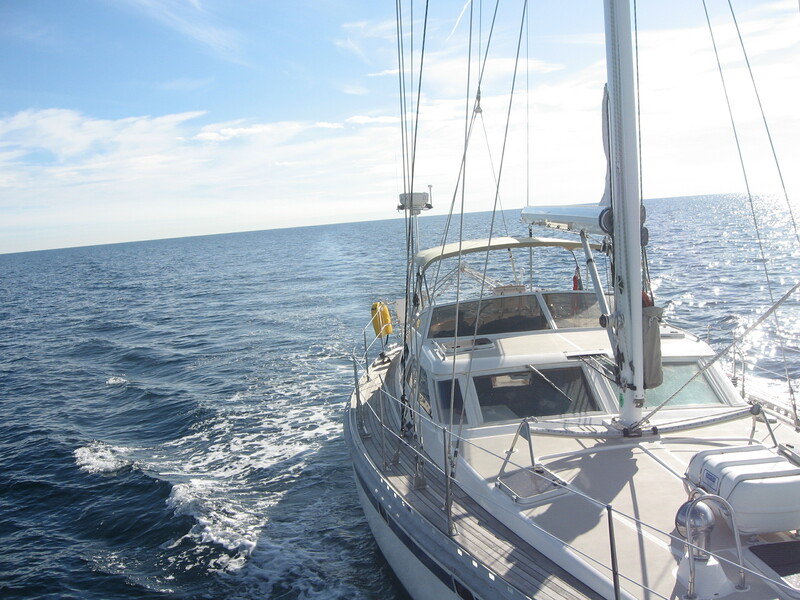 We were lucky to avoid bad weather although we had to motor 52 hours upwind. 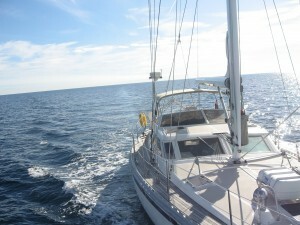 The yacht cruised easily at 7 plus knots even with at times minimal boost from the Gulf Stream. With the sound proofing and a mat overhead the engine room access, she is incredibly quiet. Her motion when it did get choppy was acceptable; the model thrives at sea. Navigation was easy from the upper salon. With radar down below, you almost never need to go out into the cockpit. If you are looking at Oysters, Hylas, and other deck salon yachts, you will be surpised by the in incredible value of the Taswell 49 All Season which retails for under half a million. Combine that with a true inside helm with throttle and you have an unbeatable passage making machine. For other yachts in this range see our reviews of the Oyster 53 and Hylas 54 RS.